Our crowdfunding campaign has ended, but you can still support the Center for Accessible Education by clicking here. The Center for Accessible Education (CAE) focuses on student health and well-being by facilitating a unique variety of academic accommodations for UCLA students with documented permanent and temporary disabilities. These accommodations are designed to promote successful engagement in the UCLA academic experience. Whether a student breaks their wrist and needs assistive note taking, or a deaf student needs a sign language interpreter for a lecture, the CAE is here to help! 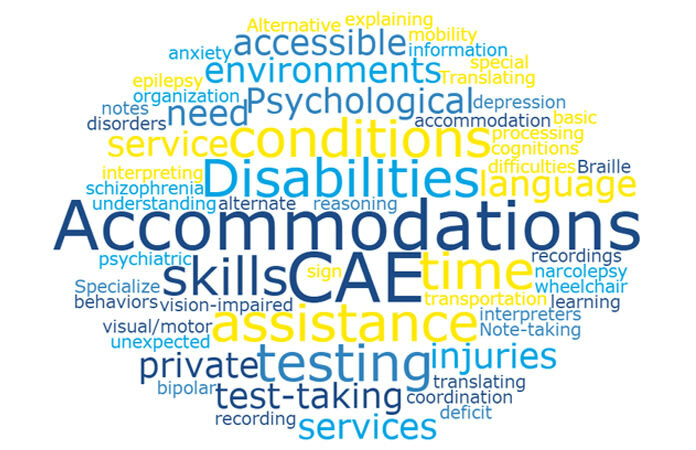 The CAE covers a wide range of both mental and physical disabilities such as: learning disabilities, psychological or psychiatric disabilities, chronic health conditions, temporary injuries, limited mobility, and sensory disabilities. The CAE always strives to work with students individually to create accommodations that are specifically tailored to meet their needs. The CAE has an obligation to the overall well-being and empowerment of the students who are registered with it. The CAE takes particular interest in ensuring that the University continues to meet the needs of all students. A large part of the work that it does centers on empowering students to be advocates for their disability-related needs. UCLA is committed to diversity, and that diversity includes students with disabilities. The CAE has experienced tremendous growth in recent years. Between 2008 and 2016, the number of students served by the CAE increased by 121%, from 1,443 to 3,192 students. The exam proctoring center has seen the largest growth in terms of both students served and exams proctored. As the CAE continues to serve an ever-increasing number of students with a wide array of disabilities, the operating budget has not kept up with the growing need. Due to the higher demand for services, and limited federal funding, it is our collective responsibility to raise awareness and funds for a program that promotes wellness and health. The CAE provides high quality, cost-free support to all students who need it! With your support, the CAE will be able to continue doing invaluable work, and reach more and more students across campus. Please help us spread awareness by sharing our campaign and cause with your family and friends, and visit our website for more information.